Until Germany's reunification back in 1990, Berlin Hohenschönhausen was often associated with it's big prison complex that couldn't even be found on any map during the GDR reign. It simply was a pretty much top secret and strictly off limits place the size of a town quarter, with all kinds of facilities to make it as autonomic as possible, all under the rule of the STASI, aka the "ministry for the state's security" of the German Democratic Republic. Thousands of detainees went through it, many political ones, but many innocent people as well. Most of the inmates got tortured in most fiendish ways until a confession was pressed out, put to paper and signed. All sorts of physical and psychological techniques of torture were used to achieve this. After that the inmates were transported to other prison camps in Germany like Ravensbrück or Sachsenhausen, well known, infamous names from the Nazi-era, as well as to the former USSR and Siberia. Today "Haftanstalt Berlin Hohenschönhausen" is a memorial site that can be visited by the public and it is a very interesting place to see. I did so in April 2015 during a photo workshop held by Leica Akademie. I got the opportunity to visit the prison section as well as the prison's hospital facilities. Following are a selection of photos I took during 2 days. To me it was a very touching as well as weird experience to see the prison cells where often innocent detainees were tantalized and tortured. The infamous "U-Boat" section (nicknamed by the inmates) in the basement with no windows, often so small that the inmate was unable to lie down or stretch himself out to sleep. Interrogation offices, in fact there are more of them than prison cells, that still emit the air of psychological terror and brutality. Same thing even in the hospital section or the outside area called "tiger cages", where certain inmates where allowed to breathe some fresh air, under constant surveillance--as preferential treatment! I am really glad that all this is over and long gone. 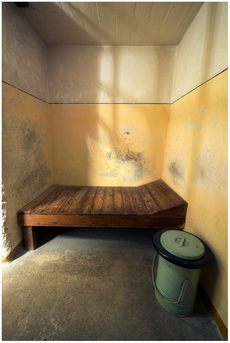 Inside a dark cell, single confinement. Although I have no hard evidence I felt an inexplainable strange connection to that place. My granddad's family used to live in Berlin-Pankow, just a few kilometers away from Hohenschönhausen and immediately after the end of World War II granddad, a decent and honest man, got denounced and was ordered to get to nearest Soviet garrison command, "just to answer some questions". Despite the advice of his friends and family not to go, he obeyed and was arrested. He finally ended up in Siberia and he died just a few years later in a prison camp near the Ural Mountains. I never met him in person. Because of the close proximity of Hohenschönhausen prison to where granddad's family used to live, as well as that Hohenschönhausen was a central transit prison to other prisons and concentration camps in the east during the time immediately after WW II, it is very likely that he had to spend time there before being deported to Siberia. But today there is no more evidence of that. I just had this strong feeling while walking through the premises. For more information about Hohenschönhausen prison please check out the links on the right side of this page. There are also books about Haftanstalt Hohenschönhausen that shed some light on the facilities during the dark ages of the communist reign. If you happen to be in Berlin, it is definitely worth a visit. Click single images to view it at full size, or click the first upper left one and navigate through the gallery in full size view using the navigation controls. To see photo titles just hover your mouse pointer over the photo. Stiftung Hohenschönhausen, the foundation that operates the site.